Form: Variable. 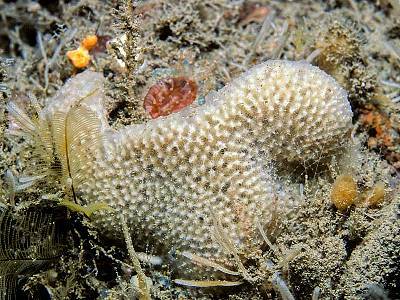 Cushions to massive-lobose forms, usually less than 15 cm across, but can be over 15cm in tidal rocky estuaries. Colour: Usually whitish or grey but can be brown. 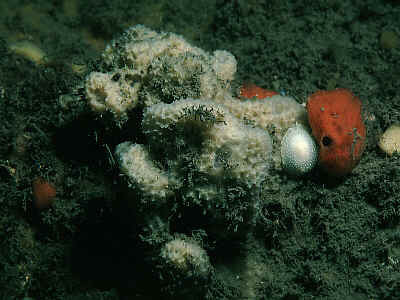 In cases where sand grains predominate over organic matter the sponge can assume the colour of sand. Consistency: Variable. Usually moderately soft and fully elastic. The elasticity depends on the ratio of spongin (elastic) to inorganic matter. Usually tough. Surface: Smooth, conulate, because of spongin fibres lifting the surface layer. The projections are sometimes lighter in colour than the main surface The surface may be slippery. Apertures: Oscules "scattered, variable in size". Skeleton: A reticulation of spongin fibres (not a tree-like structure) partially or wholly obscured by foreign inclusions (in the cores of the spongin fibres and sometimes loose in the matrix), e.g. sand grains, spicules of other sponges, diatom valves, etc. The reticulation consists of stout ascending fibres with a secondary network connecting these main fibres. The spongin is not always visible, unless the section has been stained. Spicules: None of its own. 'Foreign' spicules may be incorporated into the skeleton - see above. 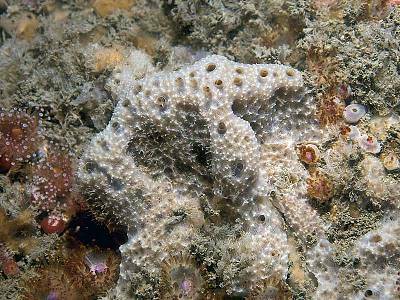 Habitat: On rock, maybe in crevices, widespread but seldom dominant (except in the Daucleddau estuary, Dyfed, and parts of the south coast). "On shell and gravel." Tolerates some silt. Distribution: "Arctic; Atlantic coasts of Europe; Mediterranean etc." Recently from St. Abbs (rare), and many sites on the south and west coast of the British Isles. Identity: The conulate surface, great elasticity, coupled with the colour (whitish) are useful diagnostic features. If any of these features is absent then demonstration of the three dimensional spongin net, with inclusions, under the microscope is essential for confident identification. Ulosa digitata is a very polymorphic species, and in certain forms can superficially resemble Dysidea, even to the point of becoming loaded internally with sand grains. However Ulosa can be distinguished by always having styles coring the spongin fibres. 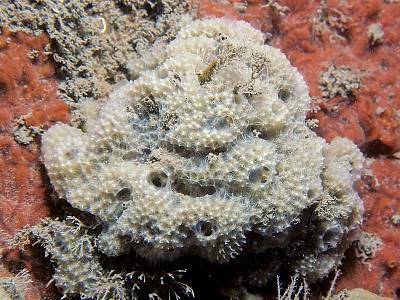 Dysidea pallescens is a Mediterranean species occurring in Lough Hyne. It may well be found elsewhere. It is pink-purple in colour with relatively larger oscules. Voucher: BELUM : Mc70. Strangford Lough, Down.